At Hennepin Healthcare we know that immigrants in our community have more fear and worries. We know that the recent increase in hate crimes, discrimination, fear of deportation and stereotyping against a person can be bad for the health and well-being of all of the people we serve. We promise to serve all people who ask for our help. We will always keep your information private. When you visit us, we do not ask for your immigration status. We never share your information unless you give us permission or it is required by law. We want to know about your worries and fears. We want you to feel safe getting help. Hennepin Healthcare is a safe place to tell us about yourself, your family, and your community. Stress can turn into anxiety and depression. We want to listen to you and understand your struggles. We want to help you with what you are facing. Are you afraid to drive? Are you afraid of going to the doctor? Are you afraid to apply for medical assistance? Tell us if you are having trouble getting to us. We can help you. We want to make it easier for all people. Immigration and Customs Inforcement (also known as ICE) has a rule that limits its power to act in "sensitive locations." This includes hospitals and doctors’ offices. This is so that you don’t have to be afraid of ICE when you get medical care. If we find out that ICE is breaking this rule at the hospital or clinics, Hennepin Healthcare will file a complaint. We denounce hatred, violence, and bigotry. We cherish relationships that lead to healing and nurturing. We believe in the creation of a more inclusive community. Here 7 days a week. It has been an honor for us to take care of you and your family. We are here to support you in all types of situations and challenges you have to face. We hope you will allow us to continue working with you. At Hennepin Healthcare we are committed to creating a culturally competent and inclusive work and care environment where all employees, patients, patients’ family members, volunteers, and business partners are treated with fairness, dignity, and respect without regard to race, color, creed, religion, national origin, gender, sexual orientation, gender identity, disability, age, marital status, or veteran status. Hennepin Healthcare has been able to survive and thrive for more than 120 years as a provider of healthcare to all in need because of its ability to serve an always changing community. A commitment to diversity makes this possible. Hennepin Healthcare's values clearly state that "every person has dignity and worth" so employees and physicians treat patients, their families, and other employees with integrity, compassion, courtesy, and respect. Hennepin Healthcare's commitment to diversity includes a Diversity and Inclusion Strategy with diversity training for employees, diversity actions identified for departments, and creation of policies, procedures, and practices that are sensitive to the diversity of our employees and patients. Hennepin Healthcare has been recognized as a Leader in LGBTQ Healthcare Equality in the Healthcare Equality Index for the sixth consecutive year. The Healthcare Equality Index is an annual survey conducted by the Human Rights Campaign—the country’s largest lesbian, gay, bisexual, and transgender civil rights organization. We earned top marks for our policies and practices related to LGBTQ patients, visitors, and employees. See more information about the Healthcare Equality Index 2017. 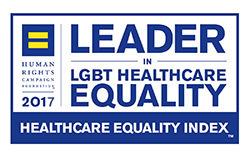 Hennepin Healthcare was one of a select group of 303 healthcare facilities nationwide to be named Leaders in LGBTQ Healthcare Equality, and one of four facilities in Minnesota to be awarded Leader status. Valuing diversity is not only the right thing to do but is imperative to the work that we do. Cultural competence enables us to deliver high-quality care, improve the patient experience, be a great place to work and be a successful and viable organization.